Real Madrid club president Florentino Perez reportedly hopes to have Cristiano Ronaldo and Lionel Messi sat together for the Copa Libertadores final on Sunday. After crowd trouble marred the scheduled fixture in Argentina, as noted by the Guardian, it was decided last month that the second leg of the final between Boca Juniors and River Plate would be played at the Bernabeu in the Spanish capital. In turn, it presents an opportunity for fans in Europe and perhaps those travelling across from Argentina to experience the game in a different environment, and it’s widely expected that countless stars of the football world will be in attendance, provided that they’re not in action themselves. According to AS though, Perez has an ambitious plan to sit Ronaldo and Messi together in the presidential box, in what is being described as a ‘gesture of respect’ for two iconic figures. 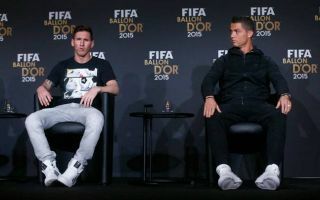 It remains to be seen if it all goes to plan, and despite the best attempts of the media to create a bitter rivalry between the pair, they have been seen talking to each other at previous awards ceremonies with Ronaldo Jr also meeting Messi too. With that in mind, it doesn’t necessarily sound like a huge decision for either, and given that Juventus play on Friday night while Barcelona face Espanyol on Saturday, both superstars will be available to attend. Whether or not there is any awkwardness between Ronaldo and Perez is arguably the bigger talking point, after the Portuguese ace left Real Madrid this past summer in favour of starting a new chapter of his career with Juventus. Regardless, after serving up a classic in the first meeting, the eyes of the football world will surely be on the Boca-River game wherever it is being watched with the tie finely poised at 2-2.